The most powerful Atlantic storm in almost a decade made landfall early today in Haiti. The most powerful Atlantic storm in almost a decade made landfall early today in Haiti, where it could deliver yet another devastating humanitarian disaster to the poorest nation in the Western Hemisphere. Some people fear that mass evacuations will become necessary in the United States. As of 5 a.m. ET, Hurricane Matthew was a Category 4 storm with maximum sustained winds of 145 mph, according to the National Hurricane Center. 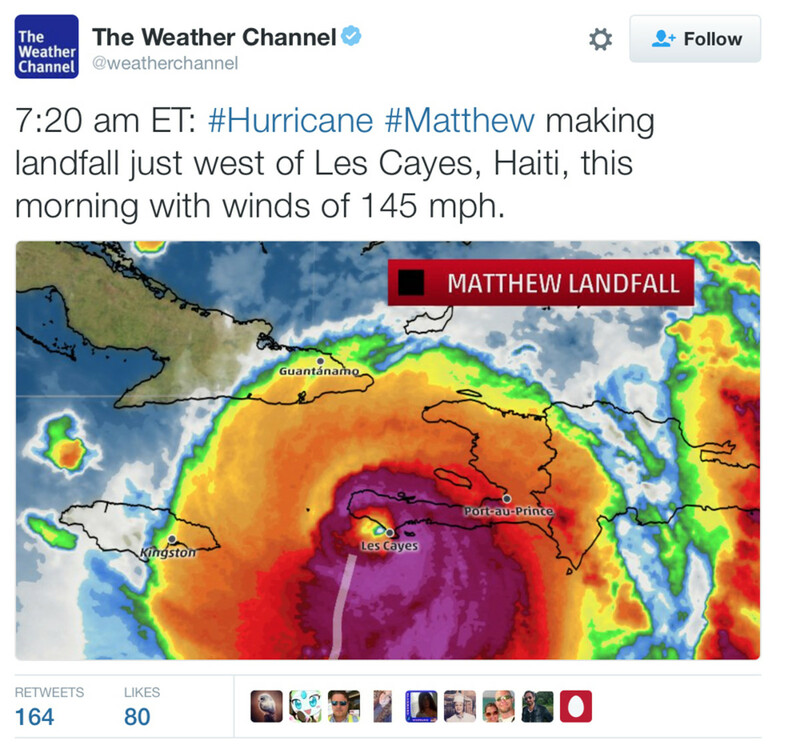 It hit Haiti just after 7 a.m., the Weather Channel reported. Although its potential impact on the United States remained unclear, NBC News meteorologist Bill Karins suggested that the storm&apos;s path could be reminiscent of Hurricane Floyd in 1999 — which required the evacuation of 2.6 million people across five states. As of this morning, Karins expected that the storm could be a "major hurricane" from Florida all the way to North Carolina, although he said the projected impact might fluctuate. Weather Channel meteorologist Kevin Roth said Matthew could dump as much as 20 inches of rain on Haiti&apos;s lower elevations and as much as 40 inches in the mountains. As the storm approached today, the rain and wind left many of the people in Haiti&apos;s southern town of Les Cayes without electricity, hunkering down in homes with roofs that were quickly deteriorating. Chris Bessey, country representative at Catholic Relief Services in Port-au-Prince, told NBC News that he was hearing reports of downed trees and significant flooding in the streets of the country&apos;s southwestern coastal towns. The storm is later expected to move on to Cuba, which forecasters said can expect between 8 and 12 inches of rain in most areas and as much as 20 inches in isolated areas. The National Hurricane Center warned that storm surges of as much as 11 feet were possible on Cuba&apos;s southern coast. A hurricane warning also was for issued for parts of the Bahamas early today. A storm surge of 10 to 15 feet was predicted there. Matthew is the most powerful Atlantic storm since 2007 and could make landfall in the United States later this week. The area most at risk is the southeastern coast, anywhere from Florida up through North Carolina. Florida Gov. Rick Scott and North Carolina Gov. Pat McCrory activated states of emergency on Monday, covering 66 counties in North Carolina and all counties in Florida. Karins warned that Tuesday was a "very important preparation day for all of the southeast coast" of the United States. "The possibility exists for mandatory evacuations, starting as early as late this evening in South Florida, and definitely Wednesday for the southern half of Florida on the east coast ... With an expected path right along Florida&apos;s east coast, Matthew could be the biggest mass evacuation of coastal Florida since Floyd in 1999,” Karins said. “And just like Floyd, it is not guaranteed that Matthew&apos;s eye will make landfall in Florida, but it will be a close call."